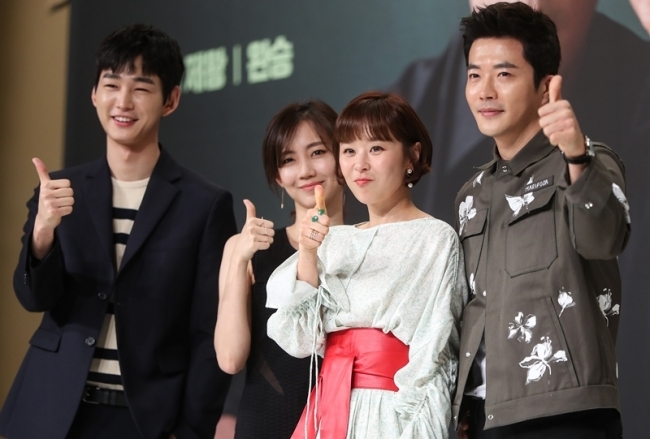 "Queen of Mystery," KBS 2TV's comic detective series, maintained its lead in the mid-week drama race, becoming the only late night show with a double-digit rating amongst its competitors, data showed Friday. Episode six of the Wednesday-Thursday series "Queen of Mystery" recorded a 10.9 percent nationwide viewership Thursday night, according to Nielsen Korea. The figure represents a 3.2 percentage-point increase from the previous day. SBS TV's "Saimdang, Memoir of Colors" stood at 8.3 percent, while MBC TV's office series "Radiant Office" came in at 6.7 percent. All three shows recouped losses from Wednesday night, when the second presidential TV debate was aired simultaneously on KBS 1TV. "Queen of Mystery" stars Kwon Sang-woo as Ha Wan-seung, an elite hard-boiled narcotics detective. His opposite is Choi Kang-hee, cast as Yoo Seol-ok, an unassuming neighborhood "ajumma," who is a natural-born genius crime solver. "Ajumma" is a generic term in Korean for married women who have the image of being middle-aged, tough and stubborn, as well as wearing unfashionable clothes.